RATH/DYSERT PILGRIM PATH, Dysert O’Dea, Corofin, Co. Clare. The walk commences at St. Blathmac’s Church, Rath. The medieval church ruins date from the 12th. – 16th. centuries and contain fine Romanesque stone carvings. Blathmac’s monastic site attributed to the 6th. century was located here. Rath Lake, home of the legendary “broc sighe” or fairy badger is nearby. On leaving the church , cross the car park and follow the minor road, passing Rath Blathmaic on the right, an earthen fort , reputed to be the birthplace of Blathmac. The road commands magnificent views of the surrounding countryside and hills. At the T- junction, turn right on to Poll Ban road. This ancient road has linked Ennis to the Stone Age, Bronze Age and Celtic settlements of the Burren, and later to the monastic sites of North Clare, for thousands of years. The Cromwellian army marched along the road in 1651, leaving a trail of destruction in its wake. Continue along the Poll Ban, taking the 2nd. right on to Bealach Arsa, a medieval roadway, suitable only for pedestrians. At the end of Bealach Arsa, ignore the 1st. left which leads to stone forts, and take the 2nd left at the crossroad and walk downhill, keeping left and pass Dysert Catholic Church. Just past the church there is a cillin, an unconsecrated burial ground for babies, who were not baptised, which was still in use in the 1940s. On the right, opposite the cillin, is a holy well, which is accessed through a small gate, Tobar Oireachta or Tobar Ortha, which has a cure for eye ailments. It is said to be the source of the sweetest drinking water in Dysert. Local tradition has it that there was a monastic site here called Blackwater Abbey but the only indication of its existence is a mound known as Cnocan na Croise, which is reputed to be the location of an ancient high cross. From the holy well, continue to the T- junction, turn left, walk on, ignore the 1st. turn on the right to Dysert Castle,and just ahead on the right is Diseart Tola (Hermitage of Tola), which is attributed to the 8th. century monastic site of St. Tola. At the end of the long road take a gateway on the right into St. Tola’s Church and graveyard. The church was extensively rebuilt in the 12th. and 17th. centuries. It has a fine Romanesque doorway. The round tower dates from the 12th. century. Leave the church grounds by climbing a stile and traverse the field to the 12th. century, St. Tola’s High Cross, a magnificent illuminated high cross with unusual features.To complete the loop walk, return to the road via the stile, church grounds and gateway. Continue on, passing Synge’s Lodge, keep to the right at the Y, take the second left and it brings you back to the start point. Refreshments are available from May to September in Dysert Castle. If you have two cars it is possible to shorten the walk by leaving a car at Dysert Castle before driving to the start point at Rath. 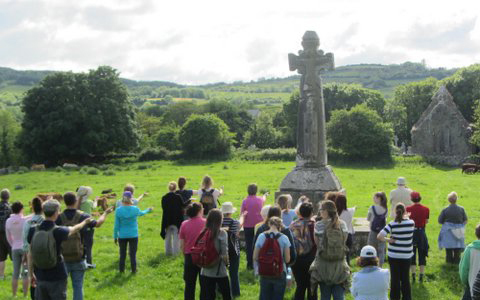 Rath/Dysert Pilgrim Path is a guided spiritual walk on National Pilgrim Paths Day. If you require further information please contact Pius Murray at 0879828173 or visit www.Facebook.com/CoisceimAnama.